Hanna has a lovely personality! She was an extremely energetic puppy to raise and her clown-like attitude has brought many laughs. I call her my velcro dog, since where I am, she has to be. This dog loves life and is just happy all the time. She is the first one to comfort me when I'm down or not feeling well. Recently I had surgery and I was amazed at the change in her attitude. Normally she is happy-go-lucky, always running around looking for something to pick up and carry in her mouth. 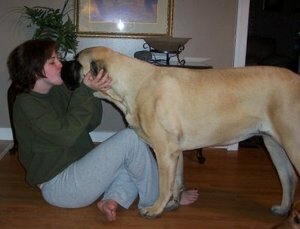 But on those days of my recovery it was Hanna by my side, with her big head on my chest, giving kisses. It was as though she knew not to carry on for a few days. If she wasn't laying her head on my chest, she was laying right by my side. I kept thinking, "Where did this calm dog come from, and what happened to my Hanna!?" Once I recovered I got the real Hanna back, and she is even more of a velcro dog. She is 2 years old now and has matured into a beautiful, loving, loyal partner!